Solar Power: How Much Do I Need and What Will It Cost? We have the pleasure of working with hundreds of people every day that want to reduce their energy bills, go green and jump on the solar power bandwagon. And the question we see over and over again is: Just how much do I need and what will it cost? We’ll tackle that question here and show you how we calculate system size and cost. We have simple solar calculators that can do this on our website but so many people have asked how this is actually calculated we thought we’d give a quick solar design lesson. We spoke to someone just yesterday that wanted solar panels on a 8’x22’ trailer. We asked him what his usage was, and his answer floored us. He was using 7000 kilowatt-hours per month, about 6 times the average household consumption. As it turns out the trailer was an enormous ice maker. This illustrates that homes and buildings of all sizes vary widely in their energy consumption. A 1200 square foot house in Florida might use 3 or 4 times what a similar house in Missouri uses because of air conditioning and different types of HVAC units. So when planning a solar system, you have to know what you use. The easiest way to do this is to simply look at your power bill. 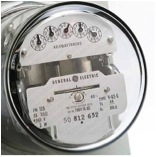 You’ll want to look at the “kw-hrs” number, which is short for kilowatt hours. A kilowatt hour is 1000 watts running for 1 hour. This number will determine just how many watts are required to almost completely eliminate your power bill. We also have to account for where you live. We deal with many customers that live in extremely sunny locations like the southeast and the Caribbean. 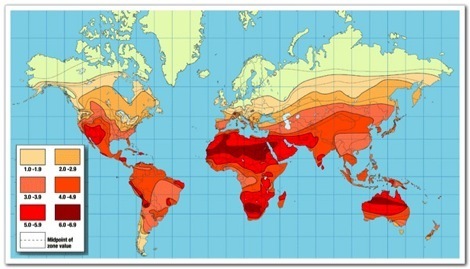 But we’ll also get calls from the Northern Territories in Canada where sun exposure is far less. A 10,000 watt system in Atlanta will generate much more power in a year than a 10,000 watt system in Alaska. The same is true of locations that are geographically much closer to each other. For instance Spokane, Washington has almost twice the sun exposure of Seattle, Washington. Now an installer will tell you that does not account for things like shading, angle of solar panels, etc., and they would be right. But for rough calculation this will suffice. Rough solar kilowatts x 1000 x $4.50/watt = Rough solar cost estimate. But, for most people, this will give them a good idea of what solar power will cost for grid tied systems. And of course this does not account for incentives at the local, state and federal level. In many areas where installation is more expensive (such as both the East and the West coast) incentives are also higher. Now you can take on the next important question: Where am I going to put all these solar panels? Kriss Bergethon is a solar expert and writer from Colorado, visit his site at Solar Panels for more information. Cool article! I’m making sure to compute our power bill when I have more time this weekend. I’ve been looking into local solar options and this gives me a way to roughly estimate my costs. Thanks a lot!